My probate was finished last week and I am not sure how to find out the total NMA I own? It says an undivided interest in the three sections about however, how do I figure out what is my share? I own 1/10 of whatever my grandmother owned. Any information would be helpful. Thanks in advance. Hi Anthony-to answer your question it is likely someone must examine, or have already examined, the recross relative to those three Sections in the Office of the County Clerk of McClain County. Do you have access to your Grandmother’s old land records? In years gone by, lease offers from landmen frequently would include that information. Not so much these days. I haven’t had any luck with the County Clerk. 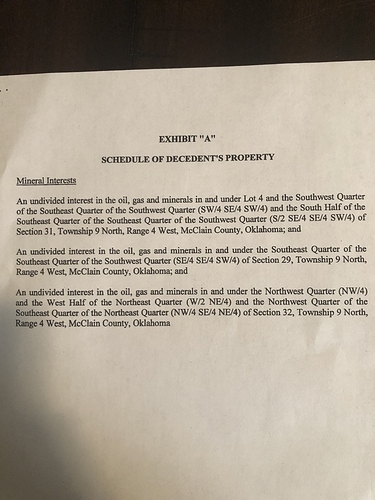 I have paperwork from EOG on one of the sections and I have the legal descriptions of what we inherited however, it doesn’t say how many acres there are total or individually. While the records in the County Clerk’s office are public records, it is not part of their duties to tell you how many nma you own. There is no “registry” where they keep track of everyone’s nma. Landmen do that kind of work, but it is difficult to predict how long it would take someone starting from scratch. If your legal descriptions are good enough, they may tell you how many net acres you have. 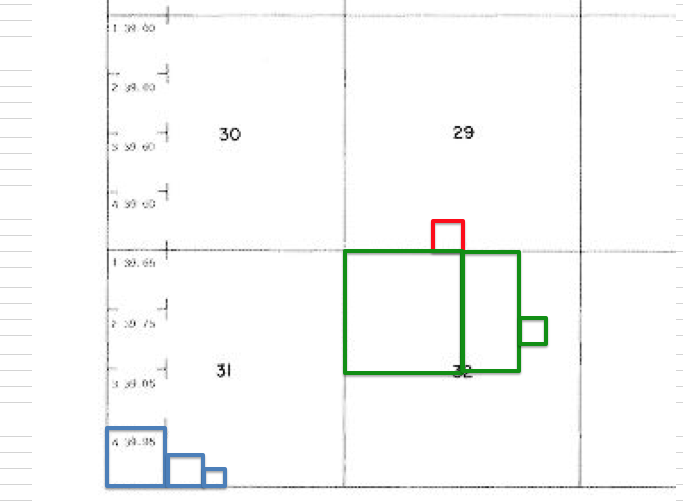 For example if it reads 1/8th undivided interest in the NW4 of the NW4, then that means you have 1/8th or 40 acres or 5 net acres. You can call EOG and ask for a division order analyst to walk you through that one. This is the legal description. Sign language to me! Thanks for all you do on here and the information you provide Mrs. Barnes. I spoke with EOG and they haven’t sent out any division orders yet. Working through the descriptions is logical if you read from right to left. Set one- “Lot 4” look up on the BLM maps. Search documents. OKLAHOMA> 9 North and 4 West Indian Meridian -Master Title Plat Home - BLM GLO Records Zoom into section 31 and you will find that Lot 4 has 39.95 acres. (Essentially this one is the SW4 SW4) Note: the Northern and Western tiers of sections are frequently corrected for the curvature of the earth, so the quarter sections on the edges are not always 40 acres. “S/2 SE4 SE4 SW4” read from right to left. The SW4, then SE4, then SE4, then S/2. (The SW has 160 acres, then 1/4th of that which is 40 acres in the SE4, then 1/4th of that which is 10 acres in the SE4, then the south half of that SE4 which is 5 acres) 5 total acres. Notice that it is contiguous to the previous one. The most you have there might be 39.95 acres plus 10 acres plus 5 acres. 54.95 acres is the max possible. It says you have an undivided interest. If you have any siblings or other heirs, then that might be further split by the will. If you are the only one, then perhaps you have the full 54.95 acres. These are in blue on the map below. 2nd set- SE4 SE4 SW4 29-9N-4W. Same thing. 160/4, then 40/4 = 10 acres. In red on the map. 3rd set- “NW4” full 160 acres. “W2 NE4” = 80 acres “NW4 SE4 NE4” = 160/4, then divide by 4 again for 10 acres. So perhaps the 250 acres, but maybe not if your ancestor had some percentage of that or you have other heirs at your level. The title folks who do the searches go back farther in time and figure out the splits based upon the original deed and all the generations title splits. For example, if grandpa had an undivided 160 acres in the NE4, but he had four children, then they would possibly inherit 40 acres each depending upon the wording of his will. Then the next generation would fractionate it even more. Did the executor have all that other information? Frequently, an exhibit will have extra words in front of that “undivided interest” such as "A 1/32 of the undivided interest… " If it passed from one person to one person, then it could stay as the original parcels, just unusual. At least this helps you visualize it. You are right, there are 5 of us that inherited these descriptions. My share is a 1/10. So it looks like there is 315 acres total which would put me at around 31.5 acres right? This is all so confusing for me. Again, thank you for all of your help! Anthony: That could be right, but probably isn’t. You are assuming that your grandmother owned 100% of the 315 acres, which she probably didn’t. You own 1/10th of what she owned. Only research of the county records will tell you what she owned. Todd is correct. Unless she had the full 315, you will get less. When you get the EOG division order, then you can contact the division order analyst and ask for a copy of the title opinion that pertains to you. They usually will give you the paragraph. It will trace the title and tell you how many net acres you have. If they won’t, then ask the DO analyst how many net acres they have credited to you and how they arrived at that figure. Then you can figure out the other two sets based upon that by doing the same math. Thank you for your responses. I have contacted EOG. All of the titles I ran through County Clerk had the same legal descriptions that I have on my probate. EOG has not sent out Division Orders yet however, I am hoping it will be soon. The legal description you have posted is what is commonly referred to as the “gross acres” in which you own some unidentified interest. You will not be able to determine your “net mineral acres” without knowing your undivided fractional interest in the “gross acres”. Furthermore, your fractional interest under the described land may not be uniform across all of the individual tracts described.